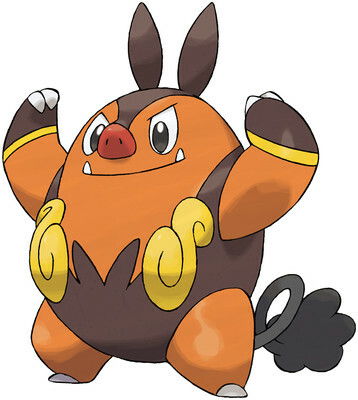 Pignite is a Fire/Fighting type Pokémon introduced in Generation 5. It is known as the Fire Pig Pokémon . The effectiveness of each type on Pignite. When its internal fire flares up, its movements grow sharper and faster. When in trouble, it emits smoke. Whatever it eats becomes fuel for the flame in its stomach. When it is angered, the intensity of the flame increases. The more it eats, the more fuel it has to make the fire in its stomach stronger. This fills it with even more power. Pignite learns the following moves in Pokémon Ultra Sun & Ultra Moon at the levels specified. Pignite learns the following moves when it evolves in Pokémon Ultra Sun & Ultra Moon (regardless of level). Pignite learns the following moves via breeding in Pokémon Ultra Sun & Ultra Moon. Details and compatible parents can be found on the Pignite egg moves page. Pignite can only learn these moves in previous generations. It must be taught the moves in the appropriate game and then transferred to Pokémon Ultra Sun & Ultra Moon. Pignite learns the following moves in Pokémon Sun & Moon at the levels specified. Pignite learns the following moves when it evolves in Pokémon Sun & Moon (regardless of level). Pignite learns the following moves via breeding in Pokémon Sun & Moon. Details and compatible parents can be found on the Pignite egg moves page. Pignite can only learn these moves in previous generations. It must be taught the moves in the appropriate game and then transferred to Pokémon Sun & Moon. We don't have any Pignite questions yet!